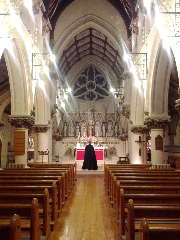 Fr Blake has organised a number of events to celebrate the 150th anniversary of the parish of St Mary Magdalen, Brighton. Last night it was a V High Mass of the Holy Ghost with Schubert's Mass no. 2 in G major, Bruckner's Locus iste, and the world premiere of Tom Bennet's Tu es Petrus. 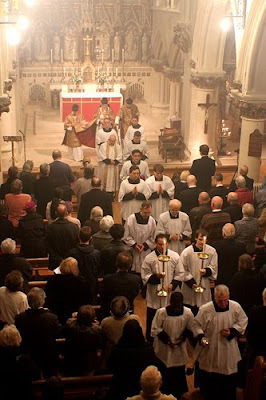 Fr Blake was celebrant, I was deacon, and Fr Simon Heans of the Ordinariate of Our Lady of Walsingham was subdeacon. I preached the sermon. To be honest, I was not really satisfied with it and wondered if people might find it a bit boring; I was surprised at the number of enthusiastic comments. I think this was one of those times where God teaches us as priests that it is not our own skill that matters but how he moves people. I'll post the text tomorrow as it is getting late tonight and there are some typos to be edited. The whole occasion was magnificent, and fulfilled Fr Blake's hopes of using the usus antiquior as a means of evangelisation. There were plenty of parishioners there, but also people of other faiths and none, some coming for a free concert, but experiencing the music in the context for which it was composed. Pray that God will move hearts through this series of events at Brighton. 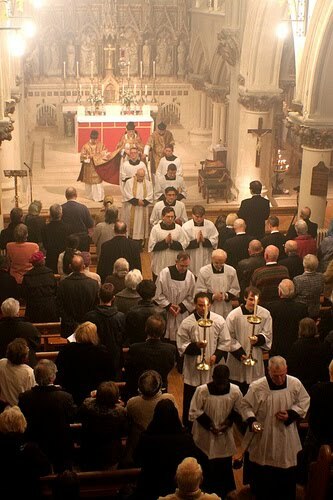 I mentioned Fr Faber's famous line that the Solemn High Mass of the Roman Rite is "the most beautiful thing this side of heaven." More than one person came up afterwards to express their agreement.